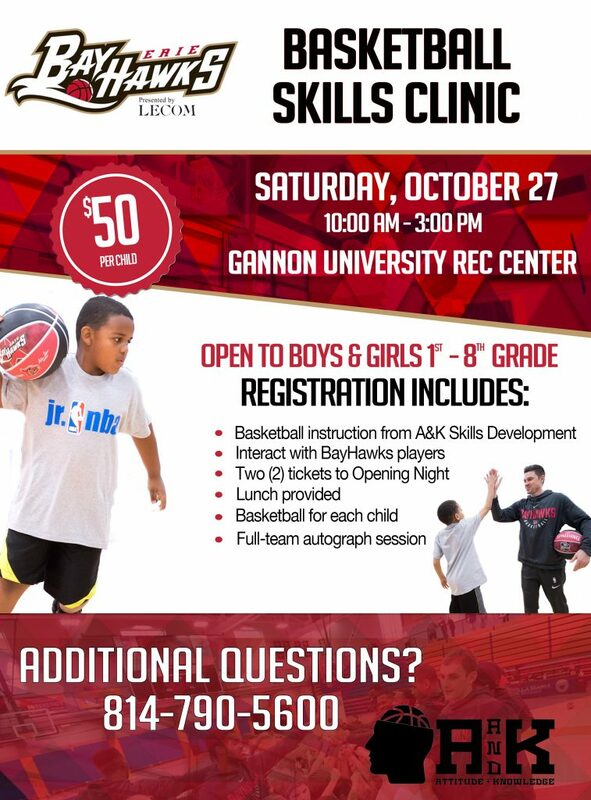 ERIE, PA – The Erie BayHawks, NBA G League affiliate of the Atlanta Hawks Basketball Club, announced today the date and time for its annual Basketball Skills Clinic, in partnership with A&K Skills Development. The clinic is set for Saturday, October 27 from 10 a.m. to 3 p.m. at the Gannon University Recreation Center (West 4th Street, Erie, PA 16507). The BayHawks Basketball Skills Clinic is designed for boys and girls, grades 1st-8th, to enhance his or her game by receiving basketball instruction from A&K Skills Development, a local basketball skills program. In addition to basketball development, lunch will be provided, as well as two tickets to Erie’s home opener on November 2, and a BayHawks basketball. Erie BayHawks players and coaches will be in attendance in the afternoon to interact with all participants, as well as sign autographs. Registration for the event is $50.00 per child and can be done so here. For more information, please contact the BayHawks front office at 814-790-5600. The BayHawks open the 2018-19 regular season by hosting back-to-back home contests, beginning on Friday, November 2 at 7:00 p.m. as the Grand Rapids Drive come to town. Erie will be back in action the following night to take on the Lakeland Magic at 7:00 p.m.
To register for the BayHawks Basketball Skills Clinic, CLICK HERE.